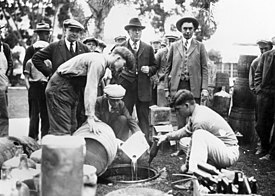 Californian police agents dump illegal alcohol in 1925, Prohibition-era photo courtesy Orange County Archives. Bootleggers and Baptists is a concept put forth by regulatory economist Bruce Yandle, derived from the observation that regulations are supported both by groups that want the ostensible purpose of the regulation, and by groups that profit from undermining that purpose. The mainstream economic theory of regulation treats politicians and administrators as brokers among interest groups. Bootleggers and Baptists is a specific idea in the subfield of regulatory economics that attempts to predict which interest groups will succeed in obtaining rules they favor. It holds that coalitions of opposing interests that can agree on a common rule will be more successful than one-sided groups. Baptists do not merely agitate for legislation, they help monitor and enforce it (a law against Sunday alcohol sales without significant public support would likely be ignored, or be evaded through bribery of enforcement officers). Thus bootleggers and Baptists is not just an academic restatement of the common political accusation that shadowy for-profit interests are hiding behind public-interest groups to fund deceptive legislation. It is a rational theory to explain relative success among types of coalitions. Another part of the theory is that bootleggers and Baptists produce suboptimal legislation. Although both groups are satisfied with the outcome, broader society would be better off either with no legislation or different legislation. For example, a surtax on Sunday alcohol sales could reduce Sunday alcohol consumption as much as making it illegal. Instead of enriching bootleggers and imposing policing costs, the surtax could raise money to be spent on, say, property tax exemptions for churches and alcoholism treatment programs. Moreover, such a program could be balanced to reflect the religious beliefs and drinking habits of everyone, not just certain groups. From the religious point of the view, the bootleggers have not been cut out of the deal, the government has become the bootlegger. Although the bootleggers and Baptists story has become a standard idea in regulatory economics, it has not been systematically validated as an empirical proposition. It is a catch-phrase useful in analyzing regulatory coalitions rather than an accepted principle of economics. Legislation and treaties to reduce global warming often command support of both polluting countries and environmentalists. Yandle and Buck argue that a similar phenomenon took place in the battle over the Kyoto Protocol, where the “Baptist” environmental groups provided moral support while “bootlegger” corporations and nations worked in the background to seek economic advantages over their rivals. Bootleggers and Baptists has been invoked to explain nearly every political alliance for regulation in the United States in the last 30 years including the Clean Air Act, interstate trucking, state liquor stores, the Pure Food and Drug Act, environmental policy, regulation of genetically modified organisms, the North American Free Trade Agreement, environmental politics, gambling legislation, blood donation, wine regulation, and the tobacco settlement. ^ a b c Yandle, Bruce (May–June 1983). “Bootleggers and Baptists: the education of a regulatory economist”. Regulation. 7 (3): 12–16. Pdf. See also: Yandle, Bruce (October 1999). “Bootleggers and Baptists in retrospect”. Regulation. 22 (3): 5–7. Pdf. and Bootleggers and Baptists: How Economic Forces and Moral Persuasion Interact to Shape Regulatory Politics. Cato Institute. 2014. ISBN 978-1939709363. ^ McChesney, Fred S. (1997). Money for nothing: politicians, rent extraction, and political extortion. Cambridge, Massachusetts: Harvard University Press. ISBN 9780674583306. ^ a b c Yandle, Bruce; Buck, Stuart (14 August 2001). “Bruce, bootleggers, Baptists, and the global warming battle”. SSRN. doi:10.2139/ssrn.279914. SSRN 279914. ^ Baldwin, Robert; Cave, Martin; Lodge, Martin (2010). The Oxford handbook of regulation. Oxford New York: Oxford University Press. ISBN 9780199655885. ^ Lasswell, Harold (1950) . Politics: who gets what, when, how?. New York: McGraw-Hill. OCLC 21939663. ^ Kahn, Alfred E. (1988). The economics of regulation : principles and institutions. Cambridge, Massachusetts: MIT Press. ISBN 9780262610520. ^ Bryner, Gary (1987). Bureaucratic discretion: law and policy in federal regulatory agencies. New York: Pergamon Press. ISBN 9780080344935. ^ Tullock, Gordon (1980), “Rent seeking as a negative sum game”, in Buchanan, James M.; Tollison, Robert D.; Tullock, Gordon, Toward a theory of the rent-seeking society, College Station: Texas A & M University, pp. 16–38, ISBN 9780890960905. ^ Wagner, Richard E. (December 1966). “Reviewed work: The Logic of Collective Action by Mancur Olson, Jr”. Papers on Non-Market Decision Making. 1: 161–170. JSTOR 25122288. ^ Buchanan, James M. (1980), “Rent seeking and profit seeking”, in Buchanan, James M.; Tollison, Robert D.; Tullock, Gordon, Toward a theory of the rent-seeking society, College Station: Texas A & M University, pp. 3–15, ISBN 9780890960905. ^ Sutter, Daniel (June 2002). “The democratic efficiency debate and definitions of political equilibrium”. The Review of Austrian Economics, Special Issue: Austrian Economics and Public Choice. 15 (2): 199–209. doi:10.1023/A:1015766621802. ^ Schneider, Mark; Teske, Paul (September 1992). “Toward a theory of the political entrepreneur: evidence from local government”. American Political Science Review. 86 (3): 737–747. doi:10.2307/1964135. JSTOR 1964135. ^ Breyer, Stephen (1982). Regulation and its reform. Cambridge, Massachusetts: Harvard University Press. ISBN 9780674753761. ^ Deprez, Esmé E.; Hogue, Millie (October 27, 2014). “Arkansas liquor stores join churches to save dry counties”. Bloomberg Politics. Bloomberg News. Archived from the original on January 14, 2015. ^ Ackerman, Bruce; Hassler, William T. (1981). Clean coal/dirty air: or how the Clean air act became a multibillion-dollar bail-out for high-sulfur coal producers and what should be done about it. New Haven, Connecticut: Yale University Press. ISBN 9780300026436. ^ Benson, Bruce L. (June 2002). “Regulatory disequilibrium and inefficiency: the case of interstate trucking”. The Review of Austrian Economics. 15 (2): 229–255. doi:10.1023/A:1015722906781. ^ Benson, Bruce L.; Rasmussen, David W.; Zimmerman, Paul R. (June 2003). “Implicit taxes collected by state liquor monopolies”. Public Choice. 115 (3–4): 313–331. doi:10.1023/A:1024240400780. JSTOR 30025994. ^ High, Jack; Coppin, Clayton A. (Summer 1988). “Wiley and the whiskey industry: strategic behavior in the passage of the Pure Food Act”. Business History Review. 62 (2): 286–309. doi:10.2307/3116002. JSTOR 3116002. ^ Lyons, Michael (Spring 1999). “Political self-interest and U.S. environmental policy”. Natural Resources Journal. 39 (2): 271–294. SSRN 171397. Pdf. ^ Meins, Erika (2003). Politics and public outrage: explaining transatlantic and intra-European diversity of regulations on food irradiation and genetically modified food. Münster Piscataway, New Jersey: Lit Transaction Publishers. ISBN 9783825867676. ^ Reynolds, Alan (18 October 1993). “The politics of NAFTA”. National Review. 45 (20): 42–44. ^ Rosenbaum, Walter A. (1995). Environmental politics and policy (3rd ed.). Washington, D.C: CQ-Roll Call Group Books. ISBN 9780871878489. ^ Schmidt, Susan (13 March 2005). “Casino bid prompted high-stakes lobbying”. The Washington Post. Nash Holdings LLC. ^ Thomas, Diana W.; Thomas, Michael D. (2010). Efficient regulation? The case of the market for blood. Logan: Department of Economics and Finance, Utah State University. Working paper. See also: Thomas, Diana W.; Simmons, Randy T.; Yonk, Ryan M. (Winter 2011). “Bootleggers, Baptists, and political entrepreneurs: key players in the rational game and morality play of regulatory politics”. The Independent Review. 15 (3): 367–381. Pdf. ^ Wiseman, Alan. E.; Ellig, Jerry (August 2007). “The politics of wine: trade barriers, interest groups, and the commerce class”. The Journal of Politics. 69 (3): 859–875. CiteSeerX 10.1.1.517.6921. doi:10.1111/j.1468-2508.2007.00580.x. JSTOR 10.1111. ^ Yandle, Bruce; Rotondi, Joseph A.; Morriss, Andrew P.; Dorchak, Andrew (2007). “Bootleggers, Baptists & Televangelists: regulating tobacco by litigation”. University of Illinois College of Law: Law and Economics Working Papers. 82: 1225–1284. SSRN 1010695. Pdf. Yandle, Bruce (October 1999). “Bootleggers and Baptists in retrospect”. Regulation. 22 (3): 5–7. Pdf. Podcast. Yandle discusses the story with Russ Roberts at EconTalk.